Episode 2 of the Mournival Podcast comes out in a week or so and I figured it was about time I had some hobby to chat about in the hobby section, so I made sure I spent the weekend focussing on a couple of units in particular. When it comes to Warhammer 30k, my two favourite units have turned out to be my assault marines (fast combat units that I also use to kill tanks) and my plasma gun armed support squads in rhinos (fast shooting units), so on the drive back from the last event, I had a lot of time to chat hobby and throw ideas about, one of those ideas was Outriders. so, against the advice* of my fellow podcaster, Keith, I placed an order the day after the event. Outirders are bikes (so fast) and they can be equipped with twin-linked plasma guns (my favourites) and anti-Tank bombs and weapons, so can basically do the job of both my favourite squads, but in one. 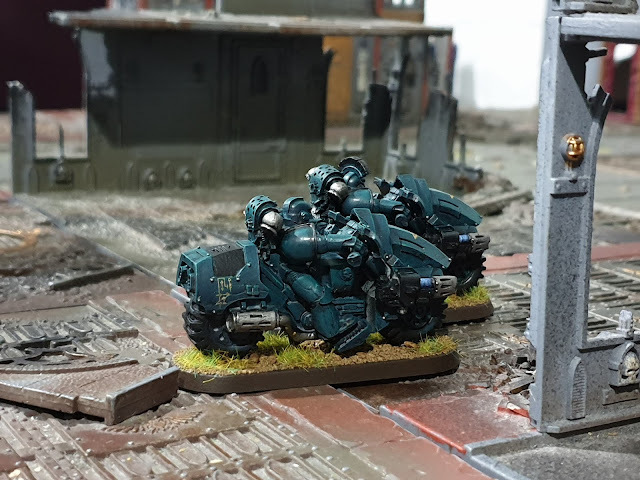 I have a feeling 2 units of 3 bikes won't be big enough to do the job, but I wanted to get them on the table and see what I could do with them. after an event before ordering anything . . . There are a couple of minor head/arm/etc swaps in the two units to try and make them more Sons of Horus 'flavoured' but nothing major. Although, I plan to do more work on any extras I add to the squads.